Where will a Work & Travel USA experience take your students? 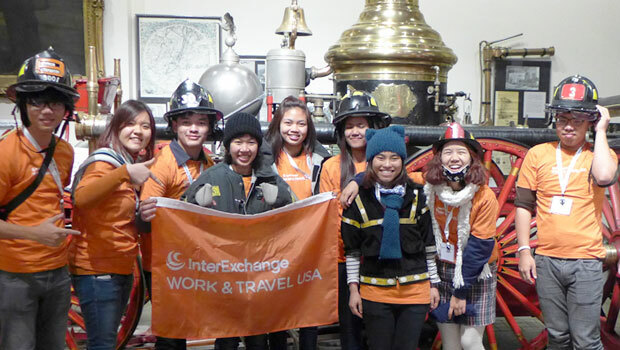 All students on the InterExchange Work & Travel USA program have basic accident and sickness insurance coverage that meets the U.S. Department of State requirements for the length of their stays. All students should have information with their insurance details, including a toll free number they can call while in the U.S. regarding their coverage, claims, or recommended area physicians. Please direct any students to contact us if they are unsure about their coverage or insurance company contact information. Please visit our insurance page for more information. Note: Remind your students to locate a doctor before they need one and always make copies of any bills and claim forms they submit to the insurance company. As with any employee, if an InterExchange Work & Travel USA student is hurt while working at your establishment, your workers’ compensation plan should provide insurance coverage. InterExchange will cease to sponsor students for any employer found to use InterExchange participant insurance in lieu of workers’ compensation insurance. Students’ insurance premiums - which they must pay themselves — are greatly affected by the size and number of claims, and InterExchange makes an effort to keep these premiums affordable. For participants injured on the job, employers are expected to arrange transportation to and from medical care and follow-up care. Do not wear headphones while driving, riding a bike, or walking. Do not carry a passport as identification. Carry a different form of ID, such as a driver’s license or a copy of the passport. Protect personal and confidential information: the Social Security number is a unique lifelong identifier. Do not allow others to use the number. Record the number in a safe place in case the card is lost or stolen. Protect both the card and the number to prevent misuse. Avoid parks, woods and remote areas when alone, especially at night. Be alert to surroundings when using an ATM. Take extra caution at night. Notify the authorities and InterExchange if you are threatened by your employer, colleagues, landlord, or anyone else. Be careful if drinking in a bar or restaurant. Watch your drink at all times, stay sober, and do not leave with anyone you don’t already know. It is illegal to drink alcohol in the U.S. if you are under 21 years old. Become familiar with laws that protect international visitors.